1 It’s not going to be dull watching Wigan Athletic this season! Played two, won one, lost one, five goals for, five goals against. Paul Cook promised on the eve of the campaign his side would be taking each and every game to the opposition, even if it meant them having to lick their wounds from time to time. On the balance of the play, they didn’t deserve to come away from Villa Park with nothing. But the standing ovation they received from the visiting supporters showed how well the performance had gone down. 2 Nick Powell belongs at this level...or even higher! In the right place at the right time to anticipate the error for the first goal, before laying on number two for Callum Connolly with an exquisite cross from the left - no wonder Villa spent most of the summer reportedly chasing his signature. On the back of a goal and an assist in the opening game against Sheffield Wednesday, Powell has picked up where he left off in the Championship two years ago. 3 Dan Burn leaves a huge hole in the Latics backline! Latics have shipped eight goals in two-and-a-half games since Burn quit the final pre-season friendly against Rangers at the midway point. And the danger posed every time the ball is crossed in from either flank will be of huge concern to Paul Cook. 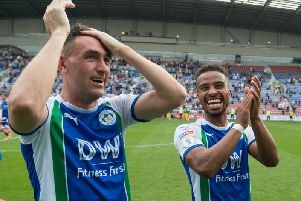 With three new-boys in the back four, it will inevitably take time to develop the kind of understanding Latics enjoyed last term...but Burn’s 6’7 frame has certainly been conspicuous by its absence. 4 Callum Connolly knows how to make an appearance! The on-loan Everton man marked his second Latics ‘debut’ with a goal...two seasons after announcing his arrival for his first loan spell with a brace at Burton. Paul Cook must surely be looking at ways to send the youngster back to Goodison Park in order for him to return for more debuts if his remarkable goalscoring exploits are anything to go by. 5 Jack Grealish likes the feel of grass on his backside! The Villa man almost joined Spurs before the transfer window closed last week, and he showed his Premier League quality with a fine display in the engine room. It’s a shame, however, he chooses to spend so much time on the deck - from minimal to no contact - rather than showing off his ability. His antics prompted Sam Morsy to give him something to send him to the deck, at the expense of a yellow card, and the Egyptian’s frustration was understandable.